Julie and Richard with some of their guests! We are passionate about dogs, we have owned and trained dogs for over 30 years, looking after dogs is what we enjoy doing and we feel very fortunate to be able to work with them every day. Having been involved with local dog training clubs over the past 15 years, we are able to offer additional help with reward based training techniques and advise with behavioural difficulties. Our Border Collies are a big part of our family and we love to have fun training them in Obedience; Agility and Flyball. 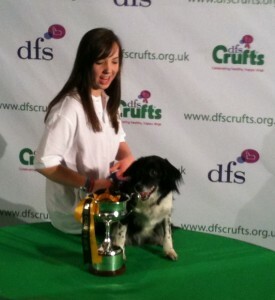 Competing and winning various events at Crufts… winning Flyball in 2007 as part of the Prestbury Park Flyball team and in 2010 our daughter, Harriet, won Crufts Agility Dog of the Year with her collie cross Sadie also in the same year winning in the agility team event with Prestbury Park – take a look at the video!